I’m obviously a huge fan of snail mail. I think it’s a fantastic way to interact and connect with other people. I’ve found that I’m much more likely to relate with someone I meet through the mail than someone I meet in person, just because the internet has tailored our ability to find like-minded people. The thing is, some people are intimidated by contacting a stranger. This is completely understandable, but today I’m going to give you some suggestions of things to talk about in your postcards and letters. I’ve received an enormous amount of introductory letters that state something to the effect of “I don’t ever know what to write in an introduction about myself!” You can use any combination of the 50 suggestions below to give your penpal a better idea about who you are. It’s all about sharing and connecting! Stay till the end to get a free mail log printable! Your preferences: hot vs. cold, cats vs. dogs, ketchup vs. mustard, etc. 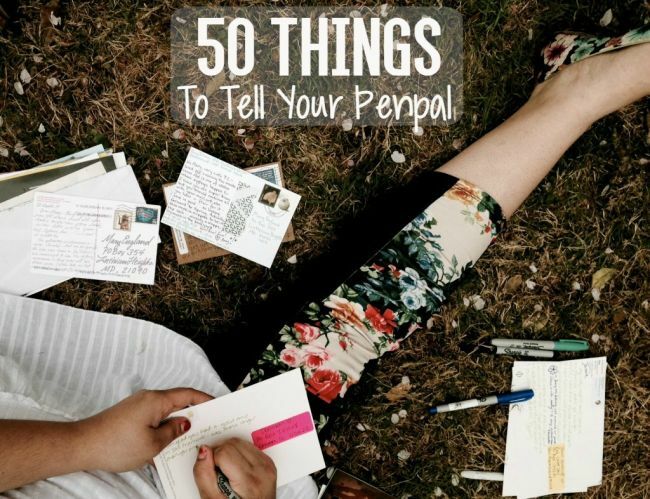 Have you ever thought about being a pen pal? Where Can I Find A Safe PenPal Website?